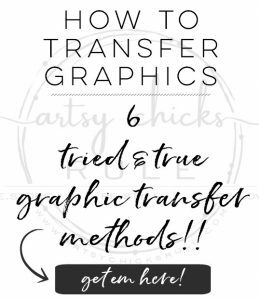 I’m so excited to be sharing this post today. It’s going to be a fun one, promise! You know why? 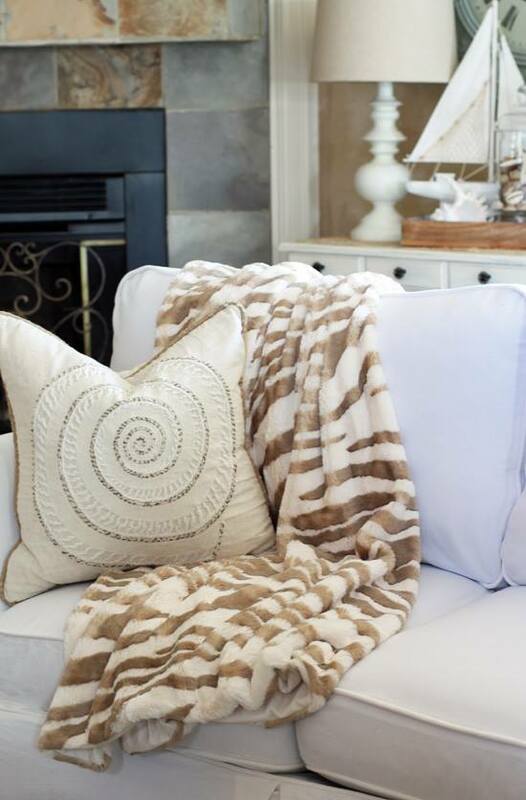 Because my decorating friends and I are giving away 6 awesome items to 6 lucky winners! We really appreciate and love you guys and want to give a big thanks for being so supportive and also sharing your decor with all of us too. If you aren’t a part of our fun group over there yet, I hope you will come by and join. It’s a wonderful, friendly, decor loving group! It’s been a wonderful experience and what an amazing ride the past 4 years have been! I also had fun styling it to show you a couple different ways you could use it. 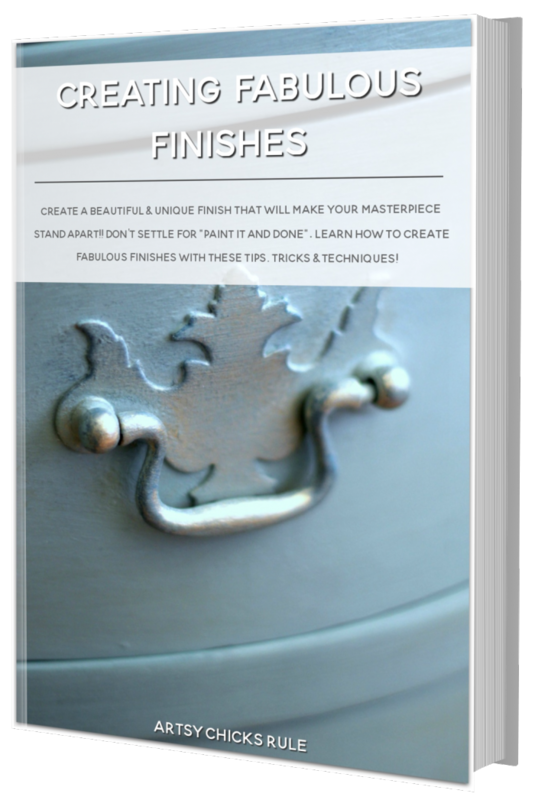 I’ll include the affiliate link to it (and a few other things) so you can take a look below. See my disclosure here. 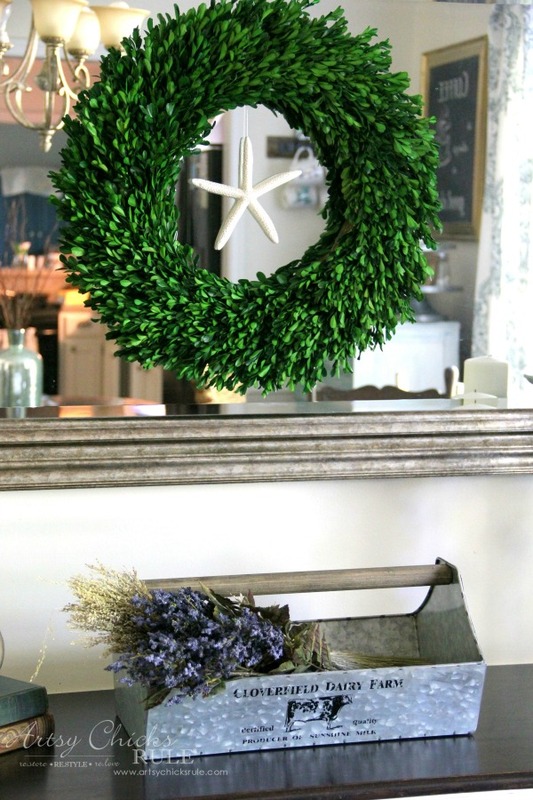 I picked up a couple things from Micheal’s to decorate it like this…. 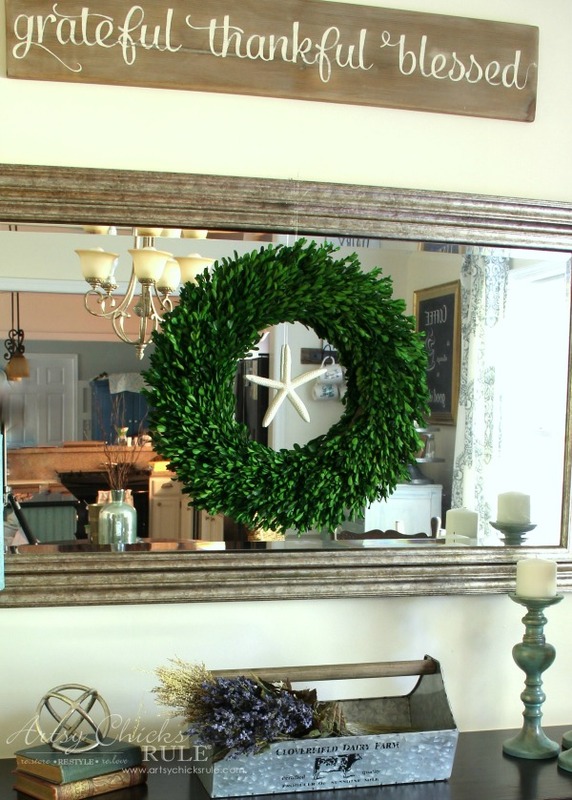 You can find the wreath here >>> Boxwood Wreath. You can find the mirror here >>> Mirror. I went a little picture happy. :) OH! And I just noticed, you can see the new paint color in the family room, in the reflection. Ahh…and in the reflection of this one, you can see the chest I’ve been working. You can find the “eat” sign (in the background) here >>> EAT sign. Tutorial and instructions for the Farmhouse Chalkboard here >>> DIY Farmhouse Inspired Chalkboard. 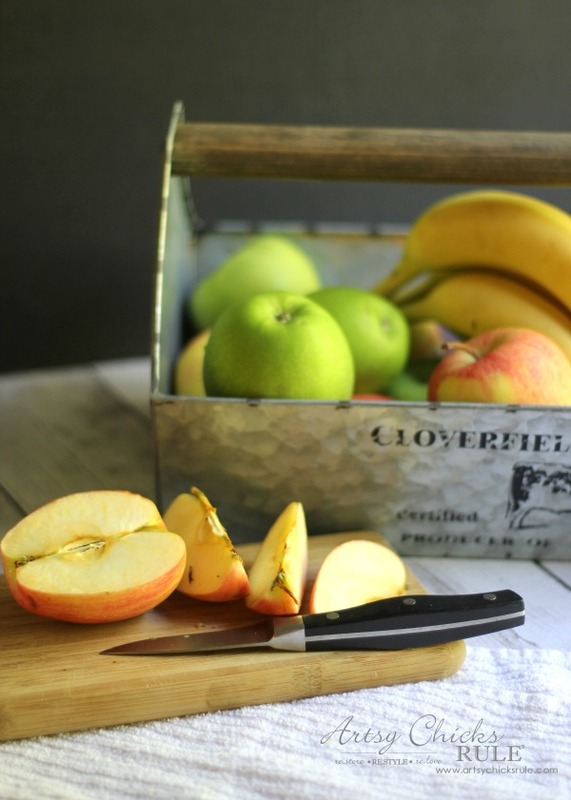 How about using the Rustic Farm Caddy for fruit? Perfect to sit in the middle of my (or your! ;) ) island, counter or table filled with fruit. Isn’t it awesome? I really love it! I was thinking about other uses and it would go nicely in a bathroom too. It could hold toilet paper rolls or even rolled up hand towels. Many things you could use it for! 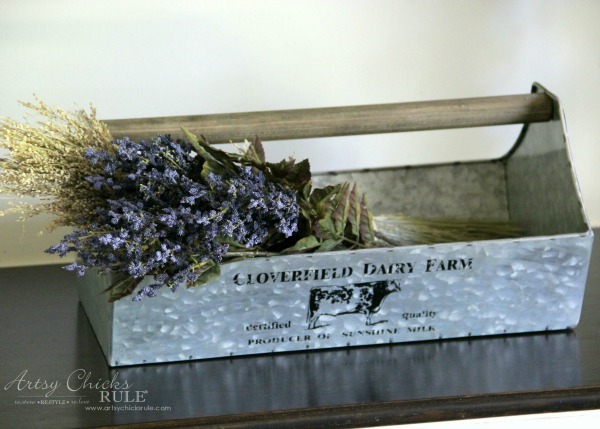 Enter to win the Rustic Farm Caddy here…. Now, want to see what else you can win? 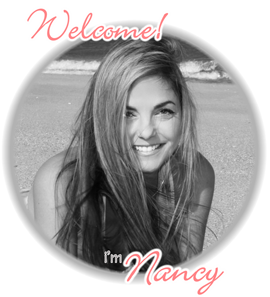 Visit Christy at >>> Confessions of a Serial Do It Yourselfer to enter to win! Visit Laura at >>> Duke Manor Farm to enter to win! Visit Debbie at >>> Refresh Restyle to enter to win! 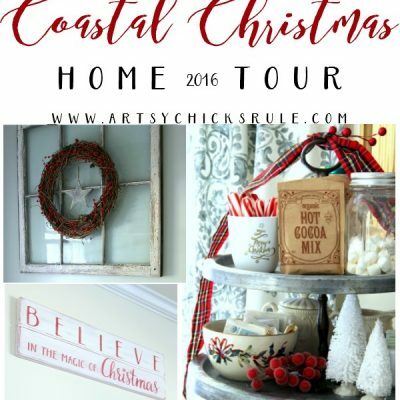 Visit Christy at >>> Our Southern Home to enter to win! Visit Shanna at >>> Restoration Redoux to enter to win! Perfect for my coffee table or in the kitchen table fulled with fruits! I just may put it in center of dining table and decorate for the holidays by putting jars of flowers in it or just decorate and use as center piece. Or may put on entry table to hold our keys, sunglasses, mail, etc. Absolutely love it! My niece has chickens. I can envision her collecting fresh eggs from the coop! I would love to win this caddy! Hey girl love the post! I may fill it with small pumpkins! I love that tray! I see white baby boos for the fall, and greenery and my favorite pinecones for the Christmas season. Oh! How about some eggs for Easter. So many possibilities ? Wow, there are so many options, I have a hard time on just one idea. This would be an adorable way to hand out Halloween candies. 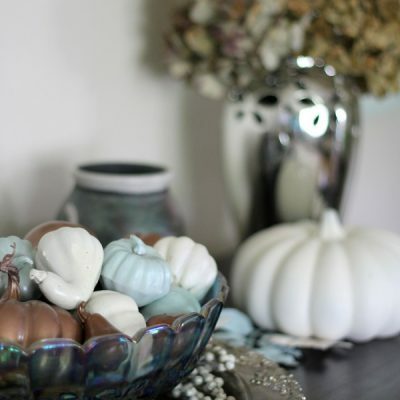 Then I’d prepare for Thanksgiving with beautiful teal/grey gourds. After that- on to Christmas! 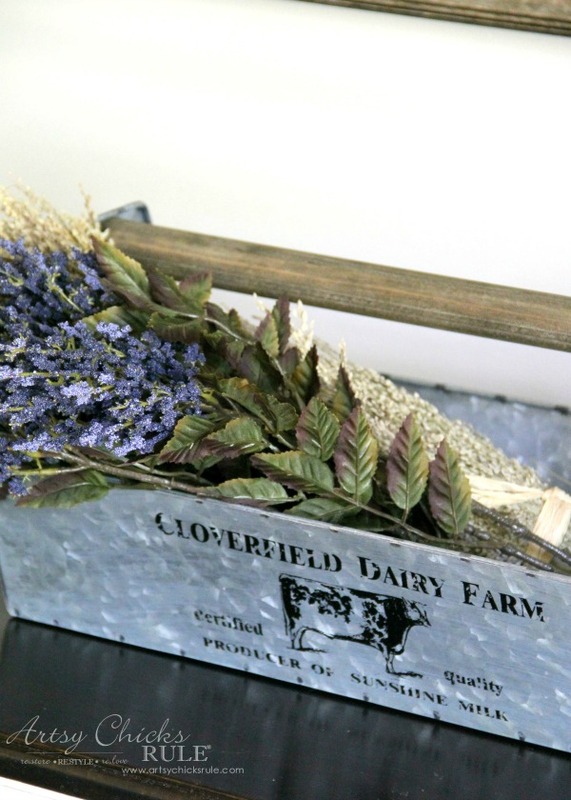 I love how you can use this farm caddy for making small decor items look important! Acorns, pinecones, pumpkins for fall. Ornaments, bells for the holidays. This is adorable, and I love your work! I would either use it for fruit or as an office organizer with mason jars. ? I would use it for the fruit and would like it with candles in it! I will fill it with fruits. So cute, I really like it filled with fruit but I think I would use it as a catch all for DH wallet golf tees and stuff out of his pockets! I would fill it with small gourds. Thanks for the giveaway. i really love the fruit idea but i think my small pots of herbs would look fab in it!!! I would use the farm caddy on my coffee table to corral remotes! I love the low profile of this! I think it would look great filled with pecans. I can see Halloween candy in it too! Really you can change it out with the seasons, Easter eggs, Christmas ornaments. Lots of options! Thinking jars with flowers? 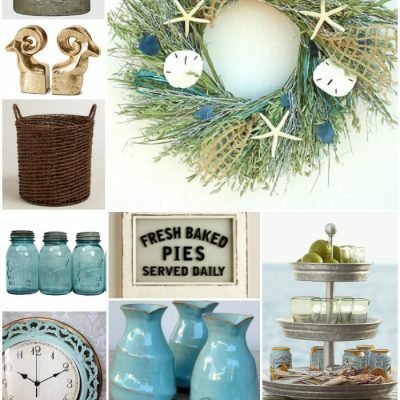 Seasonal items…… Thanks for your great ideas ! Wow it’s gorgeous! I would fill mine with and begs from my garden. Sorry I need to get used to my tablet. I meant I would use it for fruits and vegetables from my garden! Oh girl, I LOVE this! The possibilities are endless for my farmhouse style mini makeover I’m trying to achieve! I could use it anywhere for everything…. But I think it would be great on bathroom counter for brushes, combs, etc. Great giveaway!!! Thanks so much and my head is spinning with ideas as to how to decorate with!! 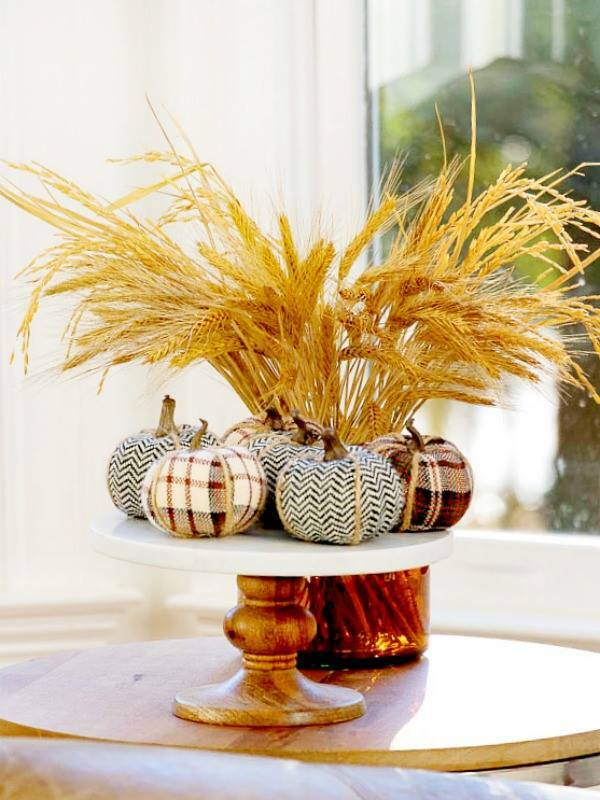 Fall Centerpiece and then for Christmas and Spring!!! Thanks Girlie!!! I would use this as a centerpiece for the dining room table, to hold decorative items in my kitchen, or even for towels in the bathroom. Great find! I love the caddy ~ and using fruit will be perfect. We eat a lot of fruit in our home. I can see this on my counter. OOOooo, I love it! What would I use this for??? What would I NOT use this for! I really like yours with the fruit in it. Thanks for this giveaway! Wow! Love this! Thanks for the chance to win! The caddy would look great on my counter replacing our big fruit bowl. There is always fruit in the bowl. Cute Caddy. Dress it up seasonally and leave it out all year long. I think I would pile in some mini pumpkins for fall. I would fill it with mason jars and flowers or leaves for the fall. So many possibilities! I would probably (first) use it on my baker’s rack with fruit in it:) Thanks for the chance to win!! 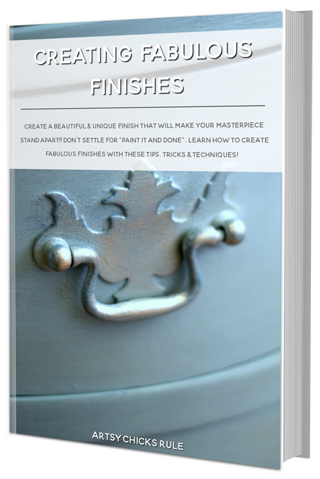 Great for decorating especially in the fall. I would definitely use the caddy to hold seasonal decor. It would always be changing! Such a great giveaway! 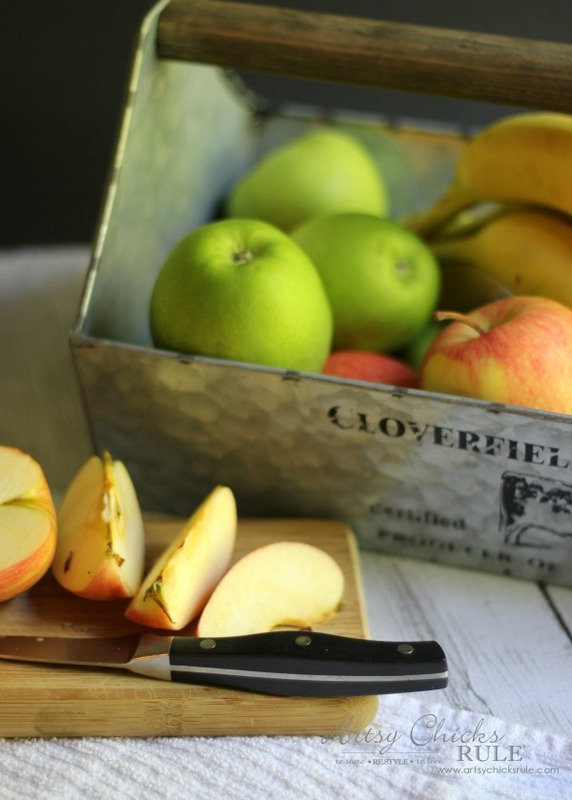 I’m thinking of several uses for this (obviously), but right now, I’m on the lookout for a fun, different way to keep fresh apples on the counter. The bowl I’ve been using is pretty basic (aka boring) and I think the caddy would be a great option! I would put it on my coffee table for an organizer for remotes and such. Thanks for the opportunity. What a way to start my Thursday! Thanks to all you ladies for the chance to win an awesome prize. 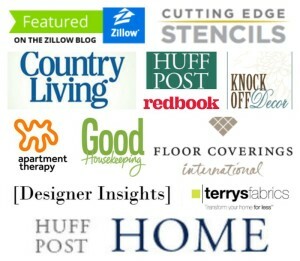 Love your blog and can’t wait to open my email each day to see what you have going on in your DIY world. Thanks again for this opportunity! You could change our it’s usage daily ! Would love to have the cgance! Thanjs! I would use it on my new coffee table! Perfect for my kitchen table or my bar area at the sink. Love anything tin. I would use in on my island between kitchen and family room. Items that go with the current season. This could be used with so many different items in it. Love this box! I would either put fruit in it in the kitchen or greenery in it as decor. I would use this Farm Caddy on my old, rustic coffee table. 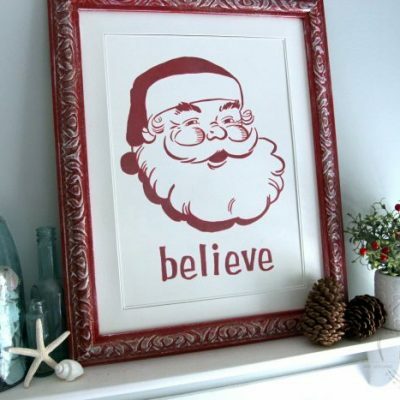 Every season I change my decorations, so I would fill it with decorations that fit the time of year. Love it for my coffee table. I would fill it full of all sorts of Farmhouse decor then give it to my daughter as a “just because” gift! 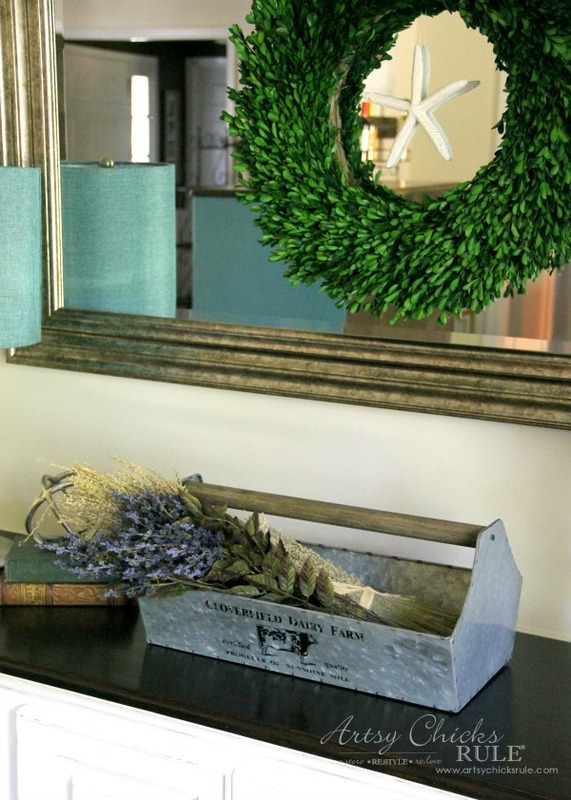 She and her husband just built their first home and they are decorating it Farmhouse style. She would love it and would find endless uses for it! 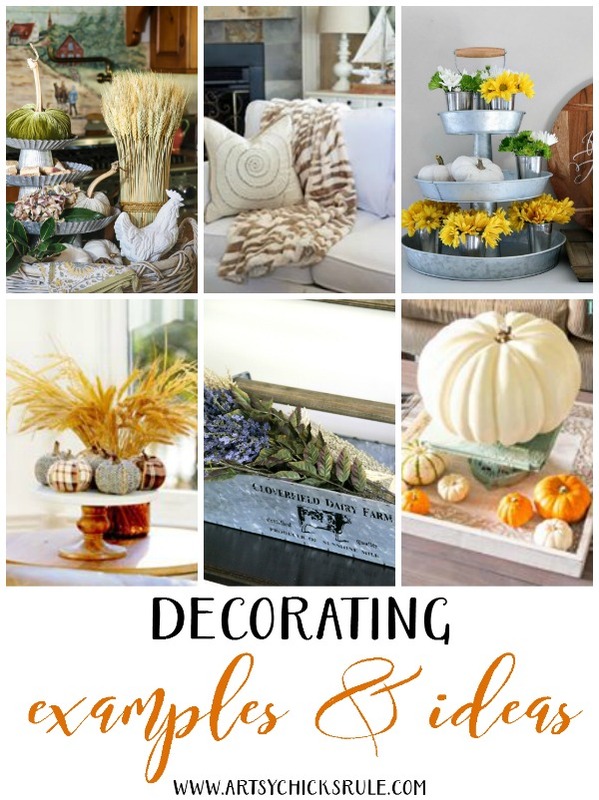 Fall is my favorite time of year, I love fall decor! This piece would be perfect on the big repurposed dresser I have in my living room! Thank you for the opportunity! I would use this in my sewing/craft room. It is very eclectic with a button chandelier, fruit baskets used for yarn and this would be perfect for all my threads! :D I just love it! So many uses but I liked your idea with fruit in the kitchen. Actually, I’d use this as a lunch box! I think it would be perfect to take for little park picnics with little milk cartons for the babies, or putting my baked treats that I hand out. That caddy would be perfect in my living room! I can already see it styled and sitting on my coffee table? Thank you for the lovely giveaway (hope i win)! 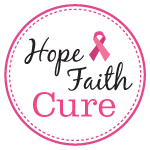 …so happy to have found your blog and the other blogs participating in the giveaways…Blessings! I would probably use it in the kitchen. 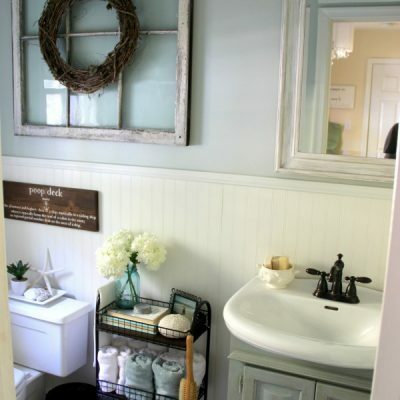 It would be cute in a rustic/country bathroom. Oh my stars!! Love LOVE love the room decor! Soo happy I stumbled upon your site!! I can’t wait to devour each post!!! I love caddies – metal, wood, you name it, I love it. Great caddy, and I love the design. I would put it on my mantel to hold candles and seasonal decorations. I LOVE this tote!!! I have always had a thing for cow items even before the farmhouse theme was popular! Thank you for the opportunity to win this awesome tote! I like the fruit idea. I would keep it on my counter to display cute pumpkins & fall flowers for this season. It’s beautiful! I would put this on my dining table. Love the simplicity of the lavender. I’d put in mason jars and fill those with flowers. Or use it for rolled hand towels in the bath. I love this. I haven’t seen a metal one. 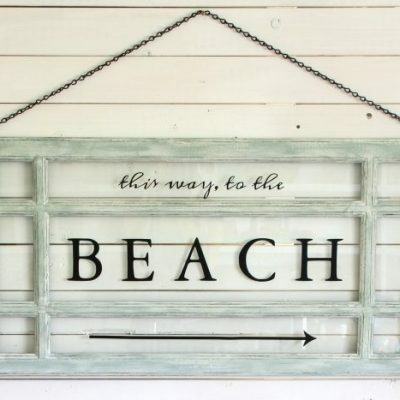 I have an old wooden one that I decorate with. I would use with flowers in living room and at Christmas I would change to ornaments. 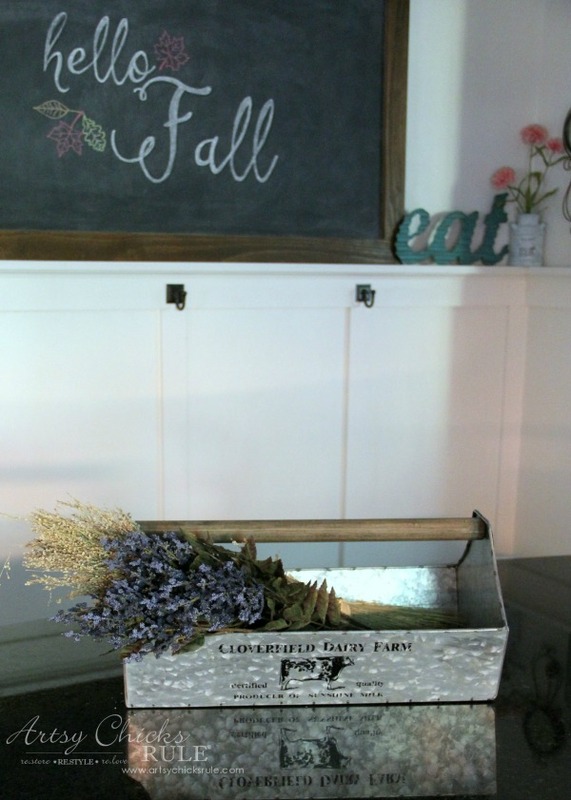 Love this caddy…think I might fill it with some little white pumpkins and a teensy bit of fall color! Love how versatile the caddy is. Stencil is great I would use this on my porch during the Fall. I would fill it with nuts in their shells and votive candles. Love this little farm box. It would be so cute to use for seasonal things (eggs, pumpkins, pine cones, apples) or just about anything. Would also be cute on the back porch filled with small potted plants during spring and summer. 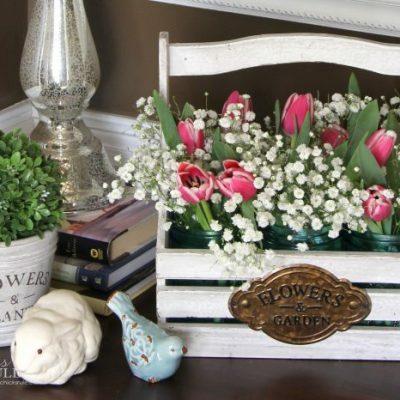 It could be used anywhere, but to be able to gather flowers in it all spring through fall would be fun. What a wonderful Gift, one lucky person will be happy! I think the caddy would be great for holding our notepads and pens we use for notes and lists. Cute caddy tote! I can’t imagine anyone not thinking of at least 10 different places to use it right away, lol. I think I’d sit it on my small hearth, and fill it with fall foliage and some little gourds. Thanks for the opportunity to win it. What a pretty piece – thanks for the opportunity! I would use it to put fruit in. Looks great for that! How cute is that! i would use it to hold cloth napkins…or a few mini herb plants in my kitchen window, or maybe mini pumpkins and wheat…or who knows what else I might find to put in it! Absolutely adorable. Looks great in every space! I’d love it on the dining room table. Adorable! This would be great to hold my coffee supplies. Thank you for being so inspiring to me. I could use this in so many places ! Fill with shells fill with soaps! These look perfect to hold jars. I would love to add this to my kitchen. I am trying to improve the farmhouse style. I would fill it with flowers sitting in the middle of my table, maybe in some of my vintage blue bottles. or just masses of gathered fall branches with leaves…or…. I would use if for a flower and herb holder. I’d use it in my kitchen filled with mason jars that hold beans, lentils, etc. I have cow decor in my kitchen, so it would be a perfect fit. I really, really like it. This would be great by the front door to hold keys and change. Here in Washington, milk is sold in short, stamped milk bottles in our small markets. I think putting three of those with, perhaps, a flower stem or two in the bottles would be cute for a table centerpiece. I also loved your lavender or lavender sage placed in it was really cute. My daughter-in-law chose to use lavender as her wedding flowers this summer, so maybe I am a bit biased. 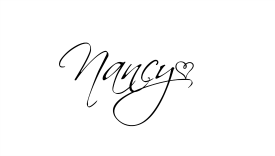 Love the tote Nancy! I’d use it for decorating my mantel! I would use to store fabric in my sewing room. I would love this caddy! I could use it just about anywhere! Thanks for the great ideas!!! Love using it in the kitchen! I’d put some small pumpkins and battery powered candles in it then switch out halloween glimmerstrings from Pier 1 out for Fall when Halloween passes. Then for Christmas, switch up for holiday decorating. Maybe even keep my homemade trick-or-treat candies in and/or Christmas nuts and truffles packages. I’d love to put the caddy in the guest bedroom with all the things overnight guest need, towels, washcloths, bath salts, lotion and perhaps chocolate. It would be perfect for my picnic table in the summer. During the day it could hold napkins, silverware etc. and at night you could add candles to enjoy after the sun goes down. I have visions of fall florals, but reality would privacy be homework supplies on the kitchen table. Perfect for the bookshelf next to my front door. The caddy is really cute. I like your idea of filling it with fruit. I would probably do that and put it on my dinning table. I would change it up for the holidays. I would use it to put our cloth napkins in. Thanks for the giveaway! Wow I just love this caddy. I have been wanting one for so long. Thank you for such a great giveaway. I just love this group!! I love this caddy so much, I would use it to store and carry craft supplies in. 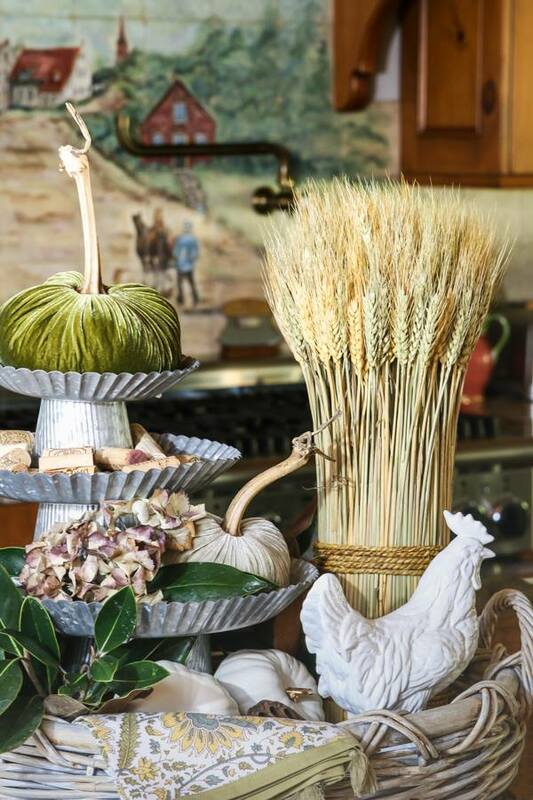 Love the farmhouse caddy — would definitely use it on dining room table to start, but would also look great on my fireplace mantle! 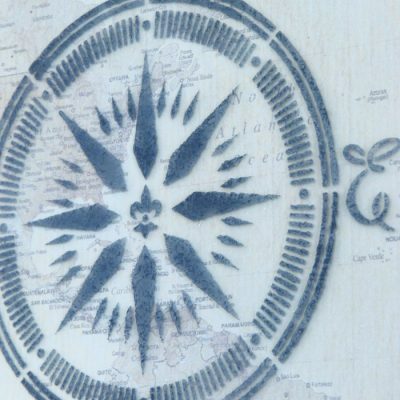 I enjoy your blog and appreciate the opportunity to win such a wonderful give-away! Sooooo excited to win, lol! I would use it to show off my baked goodies! 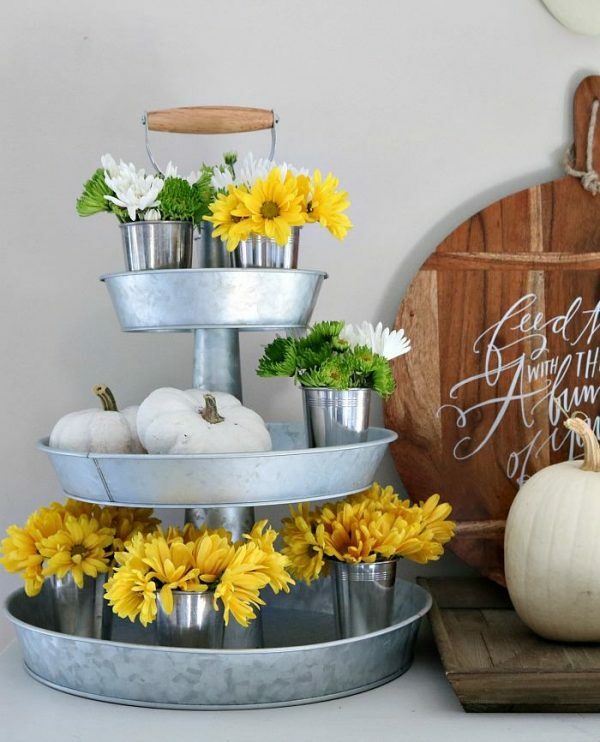 Love the rustic farm caddy. I would probably use it to organize my ribbon. That caddy is just so cute! It makes me want to go out in the garden and pick flowers! Or have a garden party, (it is raining here right now, though! so I will have to wait. Well that’s the cutest thing ever. Love the wood handle. Thanks for the chance to win. Would love to transition my kitchen into more of a farmhouse feel and this would be the perfect start! 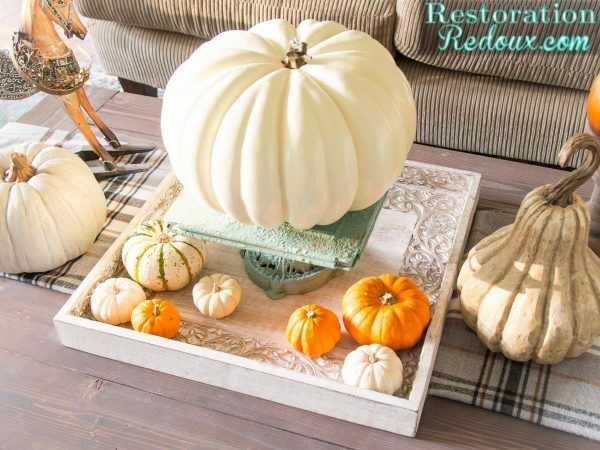 Maybe in the center of my farmhouse table with colorful gourds for fall! That caddy would be really cute in my kitchen with maybe some small potted trailing succulents in it. Thanks for chance to win? I could use in the entry to hold winter hats and gloves or it could hold kindling by the fireplace. I would use it to put fresh fruit or flowers in! This is so neat and so versatile. Initially I would use it for fruit in my kitchen. I love it with the flowers also. Thanks for this opportunity. I’ll put that on my desk! It needs something more. Hands down absolutely love this caddy! Would use it for many purposes in my kitchen! I have a farmhouse style coffee bar where the caddy would look great filled with coffee mugs! For all those little mix packets, ranch dressing, Pepper Gravy, Taco seasoning, etc. This way I can leave them out and they will be beautiful in this! Thanks for a great giveaway! Good luck everyone! I would either use it for a fruit bowl or to hold towels or toiletries in the bathroom. Love this caddy!! I would use it for seasonal decor: pumpkins, gourds, etc, right now. Then evergreen branches and ornaments at Christmas… the list is endless? I would use this in my kitchen for sure, would compliment the kitchen perfectly for baked goods, fruit, flowers, love it! I would put it on my palette coffee table! That I made myself! I sure could use this. Wish e good luck! Perfect for my hot chocolate bar for the upcoming holidays. Would carry my “smalls” for decorating a specific room/area…such as screws, screw driver, nails, rope, ribbon…..ALL the little things you need when working on a project!! The list goes on and on……. I would enjoy using this to hold napkins and silverware on a buffet table. Thank you for the opportunity to win! I would have it in the kitchen and use it as a fruit bowl! This item would look fabulous on my new “old farmhouse” table. My hubby and I just completed it last weekend.